There is no place like Scandinavia during Christmastime. It’s cold, snowy and dark and one of the most cozy places on earth. Tasteful decorations are abound and a host of traditions incorporating Christian, Pagan, Norse Mythology and Winter Solstice celebrations keep the season bright. One of my most cherished traditions is going to Christmas markets. Handmade arts and crafts and ingeniously designed housewares and other practical things are usually available. I have found that information concerning these markets is often scattered about in many different places making it a little tricky to find out just when and where they take place. Thanks to an Expat newsletter I received, as well as doing some research on my own, I have compiled a fairly comprehensive list. What to expect: Stroll around Tivoli and sample the Danish Christmas treats ‘gløgg & æbleskiver’ a hot and spicy drink made on red wine and traditionally accompanied by round, pan-fried cakes served with sugar and jam. Or visit one of the 20-odd restaurants and have a traditional Danish Christmas lunch with pickled herring, liver paté, meat balls and other Danish delights. Most of the restaurants also offer a la carte international cuisine if you are not up for culinary experiments. Visit Nissekøbing and study the life of the Danish pixie or gnome (‘nisse’) in this grand display of mechanical puppets. You can also listen to the Nisse Band playing Christmas songs, enjoy the Tivoli Boys Guard Parade or meet Father Christmas/Santa Claus – in Danish Julemanden – who has settled with his sleigh and reindeer to listen to your innermost wishes. Just like any family, Tivoli likes to add to its collection of Christmas ornaments. For 2006 the Tivoli designers are preparing a giant snow globe in front of the exotic Nimb Building. Really, Christmas at Tivoli is not to be missed. Mondays, Tuesdays, Wednesdays and Fridays 11:00 – 18:00, Thursdays 11:00 – 20:00, Saturdays 10:00-17:00, Sundays 11:00 – 17:00. 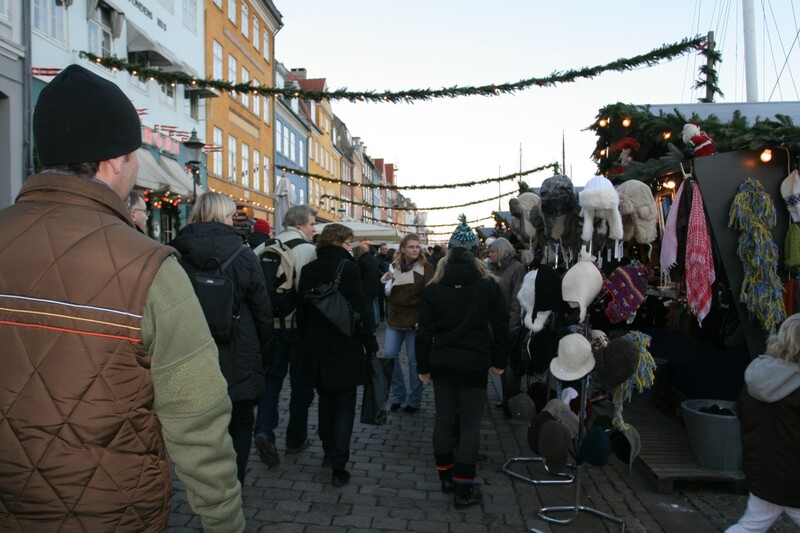 A very popular annual tradition featuring many stalls with Swedish Christmas specialities, arts and crafts. In Gustavskyrkan, open from 11am to 5pm. Along the quaint old canal off Kongens Nytorv, stalls offer samples of Danish Christmas specialities, decorations, gifts, candles and other examples or arts and crafts, which have been especially produced for the Christmas crowd. On weekdays from 5 to 6pm you may chance upon the ‘old watchman or town cryer’. Jette Frölich, Danish designer who has made decorations for Royal Copenhagen Porcelain for many years, presents her Christmas Design 2006 at Gammel Holtegård, 170, Attemosevej in Holte. Open weekdays from 1 to 6pm and weekends from 11am to 6pm and in Illums Bolighus on the pedestrian street, Strøget, downtown Copenhagen, there will be a Jette Frölich outlet from 28 October to 17 December on the second floor. NISSEVERSITY – only for children! Now you have the chance to learn, all that a true Christmas nisse should know. This includes the difficult wooden clogs walk, writing with the artistic nisse handwriting, getting your very own cat friend and much more. Also test your nisse knowledge. When you have passed the test, you receive a nisse diploma and a list of ten typical nisse tricks. Bring your own best nisse cap. In the restaurant there will be glögg (i.e. mulled red wine), and you can shop Christmas gifts in the museum shop. In the harbour of Køge, south of Copenhagen, there is a regular ferry service to the island of Bornholm in the Baltic. On the first weekend of December this ship arrives loaded with the best products Bornholm can offer. Visitors on board can taste, smell, sample and buy and, most important, feel the Xmas spirit! Open daily from 10am to 5pm. A vintage vehicle is used as shuttle bus and, naturally, the rest of Køge will follow-up ready to receive the many Christmas shoppers. A festively decorated Open Air Museum celebrates Christmas and sets the stage for an exploration of traditions in the old farm, the manor house, the old water mill and in the community hall. Visitors will experience Christmas traditions in Denmark through 300 years, with activities for families and children. See the decorated Christmas trees, smell the food on the farmers opulent table and taste the home made cookies in the kitchen at the manor house. From 10.00 – 17.00 / 10 am -5 pm, activities from 11.00 – 15.30 / 11am -3.30 pm. Although Karen Blixen used to spend Christmas Eve in the home of her sister Ellen Dahl or with other family members, there were very special traditions in her own home: Rungstedlund up to the holidays. The Christmas tree was decorated with a top star, tinsel, white paper cut stars and glass and silver globes and as a finishing touch the white candles. Following these same traditions the museum decorates a tree every year, which can be admired from 6 Dec. Everywhere in the museum there are also floral decorations, inspired by another of Karen Blixen’s talents. The museum café serves Danish Christmas goodies and is decorated with Sonia Brandes’ hand cut Christmas decorations that can be purchased in the museum book store. Popular market with many stalls filled with all kinds of products just right for your Christmas preparations! Open both days from 10am to 5pm, admission fee DKK 30 for adults, children accompanied by adults go in free. At Bella Centre. See Santa as he sails into Helsingør harbor. From the harbor he will go to Axeltorv for the lighting of Helsingør’s Christmas tree at 16:00. This is annual event and is heavily attended. Be sure to get their early. Many thanks to Barbara Mozdzierz & Jennifer Burnham for allowing me to post this information. Open M-F from 14-20 (2pm-8pm) and from 12-20 (12pm-8pm Sat & Sun. and until 18 (6pm) on the last day. Hi, I’ve been waiting for your update for a long time now:) Thanks for the tips for Christmas shopping. I’ll be in DK on Dec. 13th so I can’t wait to visit all the markets. Hey there! Thanks for that. I’ve been snowed under with a big project. But I’m surfacing again…thanks for noticing. Hi, thanks for sharing. I was actually looking for some information on Christmas Market in Copenhague and as you stated infos is not only scattered but also rare! My pleasure! It’s always one of my favorite things to do! The dates/places change every year but some stay the same so look out of updated info! Can’t believe it’s Christmastime soon again!